The 95th Vasaloppet will start in Sälen on Sunday, March 3, 2019, at 08:00. Vasaloppet is fully booked, as usual, which means 15,800 registered participants. In total around 62,000 participants have registered so far for the Vasaloppet Winter Week 2019 races. This is the 42nd year that Vasaloppet will be broadcast live on Swedish Television. Here is some background information for the world's biggest cross-country ski race. Gustav Eriksson’s adventure in Dalarna took place during the winter of 1520–21. In 1523 he was elected King of Sweden. The first Vasaloppet took place on Sunday, March 19, 1922. Now the 95th Vasaloppet will take place, which is also the 23rd with a special competition class for women (started in 1997). Three races have been cancelled: 1932, 1934 and 1990. Since 1948 the race has always run on the first Sunday of March, except in 2015 when the race ran on the second Sunday because of the World Ski Championships in Falun. The first live TV broadcast of Vasaloppet took place in 1966. This will be the 42nd time that Vasaloppet (in part or in its entirety) is transmitted live, and it’s the 37th time that the Vasaloppet start is broadcast live on television. 1973 was the first year with a live broadcast in colour. Since 1992 Vasaloppet has been shown live every year. Vasaloppet and SVT’s current broadcasting agreement extends until 2020. Vasaloppet was first broadcast on Swedish Radio in 1925. Since 1922 a total of 575,620 Vasaloppet skiers have completed the 90-kilometre Vasaloppet; put together they have covered a distance equal to 1,292 round the world trips or 67 journeys to the moon and back! But if you look at the amount of Vasaloppet participants in 2019 per capita things look a bit different: Dalarna (2.74 participants per 1000 residents) is biggest followed by Jämtland (2.27), Jönköping (2.21), Uppsala (1.79) and Norrbotten (1.72). Vasaloppet 2019 has participants from 45 different nations, counting Sweden. About 3,700 of the registered participants come from countries other than Sweden, most from Norway (1,115). Then come Finland (551), Denmark (462), Germany (303), Czech Republic (264), Estonia (138), Switzerland (138), Italy (132), Netherlands (91), Iceland (67), Austria (64), Russia (63), France (51), Great Britain (32), Belgium (31), Canada (29) and the USA (24). The average age of Sweden’s population (2018-12-31) is 41.23 years. The average age in Vasaloppet 2019 is 42.2 (42.8 for the gents and 39.0 for the ladies) and the average participant has skied Vasaloppet previously 3.7 times. For the first time ever there are over 2,500 women ladies registered for Vasaloppet, which means we’ll have 16 percent female participants in the tracks this Sunday. Andreas Nygaard, Norway, won Vasaloppet 2018 and the ladies’ class victor was Lina Korsgren, Sweden. The latest men’s class winner from Sweden was Jörgen Brink in 2012. The male winners these past six years have all been from Norway. Apart from Andreas Nygaard we’ll see several previous victors in the elite group this year: Anders Aukland, 2004, Jörgen Brink, 2010, 2011 and 2012, John Kristian Dahl, 2014, 2016 and 2017 as well as Petter Eliassen, 2015. Also worth noting: Stanislav Rezác, Czech Republic (born 1973), skiing his 21st Vasaloppet this year. 14 out of 20 times Rezác has been in the top 10, and in the top 3 six times, but no win. The female winners from these past four years are all in the elite start group this year: Laila Kveli, 2013 and 2014, Katerina Smutná, 2016, Britta Johansson Norgren, 2017 and Lina Korsgren 2018. 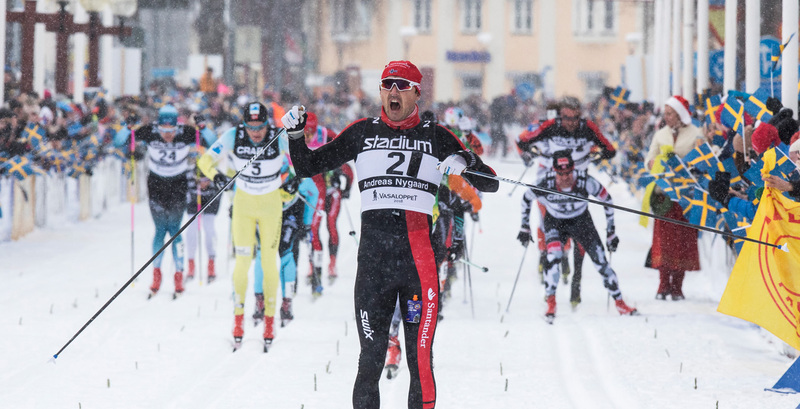 The international cross-country cup Visma Ski Classics takes place for the ninth time. Vasaloppet is the season’s eighth race, after which four competitions remain: Engadin Skimarathon (50 km) in Switzerland on March 10, Birkebeinerrennet (54 km) in Norway on March 16, Reistadlöpet (42 km) in Norway on April 6 and Ylläs-Levi (70 km) in Finland on April 13. The winner of each race in the cup gets 200 points, second place gets 170, third 140, fourth 120 and fifth 100. Thereafter 95, 90, 85, 80, 75 and so on down to 1 point for 50th place. The current charts show Norwegian dominance on the men’s side but there are more Swedes in the ladies’ top ten. 1) Andreas Nygaard, NOR, 779 points. 1) Britta Johansson Norgren, SWE, 850 points. The awards ceremony for Vasaloppet 2019 takes place at 15:00 on stage at the Vasaloppet finish line. The first prize is a kiss, a garland, a trophy and 95,000 SEK (for both the winning man and woman). The men’s class winner will also get the Kranskulla honorary award. The first prize is now raised by 1,000 SEK every year. If a winner, male or female, breaks the Vasaloppet record time for their class they are awarded a 50,000 SEK record bonus. Everyone who completes Vasaloppet gets a diploma. Participants who finish within the winning time plus 50 percent are also awarded the Vasaloppet medal. In 2018, 3,054 men were awarded the medal. For them the medal time was 6.36.54 since Andreas Nygaard’s winning time was 4.24.36. 181 women were also awarded the medal in Vasaloppet 2018. The 2018 medal time for women was 7.02.45 since Lina Korsgren’s winning time was 4.41.50. This year’s Kranskulla is skier and biathlete Emma Höglund (Kranskulla no. 95) and the Kransmas is ski cross competitor Victor Sticko (Kransmas no. 31), both from IFK Mora. 57 men have won the 94 races. One time, in 1988, the victory was shared. Most Vasaloppet victories: Nils ”Mora-Nisse” Karlsson (9 wins), Janne Stefansson (7 wins), Arthur Häggblad and Jan Ottosson (4 wins), Oskar Svärd, Daniel Tynell and Jörgen Brink and John Kristian Dahl (3 wins). Sofia Lind has most victories, four, in the women’s class (1997, 1999, 2004 and 2005). Sofia Lind was also the top woman in 1996, the year before Vasaloppet’s official ladies class was introduced. Ernst Alm, who in 1922 won the very first Vasaloppet, is the youngest male victor. He was 22 years and 18 days old when he won (born 1900-03-01). The oldest Vasaloppet victor is Jörgen Brink who was 37 years, 11 months and 23 days when he won in 2012 (born 1974-03-10). Youngest and oldest Vasaloppet winners among the ladies, since the official women’s class was introduced in 1997, are Sofia Lind (born 1975-09-04) and Svetlana Nagejkina (born 1965-02-02). Sofia Lind was 21 when she won in 1997 and Svetlana Nagejkina was 37 when she won in 2002. Just eight male and three female winners have managed to defend their Vasaloppet title by winning two years in a row. The latest were John Kristian Dahl in 2017 and Laila Kveli in 2014. Only four victors have won three or more Vasaloppet in a row: Nils “Mora-Nisse” Karlsson (a total of 9 wins, of which 7 were in a row), Janne Stefansson (7 total wins, 5 in a row), Jan Ottosson (4 wins, 3 in a row) and Jörgen Brink (3 wins). The highest number of years between a victor’s first and last win is 10 years (“Mora-Nisse” Karlsson 1943–1953). The current record time for men is 3.38.41 (Jörgen Brink, 2012) and for women 4.08.24 (Vibeke Skofterud, 2012). In 2013 Jörgen Aukland became history’s first Vasaloppet winner to pole his way through the whole race without using grip wax (since skate was prohibited). In 2014 Laila Kveli became the first lady to win without grip wax. 07:18–13:00 Radiosporten live broadcasts from Vasaloppet. There will also be recaps in later broadcasts. 07:30–12:45 and 15:30–16:25. SVT Sport live broadcasts Vasaloppet in SVT1 and SVT Play. Host: Yvette Hermundstad. Live commentary provided by Jacob Hård and Anders Blomquist. Meteorologist: Pia Hultgren. Reporter in Smågan and Mångsbodarna: Maria Wallberg. Reporter in Sälen/Evertsberg/Mora: Markus Granseth. Reporter Vägövergången: Daniel Nannskog. Reporter Smågan: Therese Bosta. Skiing reporter: Mattias Svahn. Broadcasts run 07:30–20:00 in SVT Play. 07:30–13:00 Live reports from Vasaloppet, video clips, questions and answers with SVT and Vasaloppet. 07:45 – The whole of Vasaloppet is live streamed online with English commentary. Can be seen worldwide at a cost of 75 SEK. Vasaloppet has different number series for different start groups. The men’s elite group have start numbers 1–300; the ladies’ elite have start numbers starting with 500. Start group one has start numbers 1000–1499 etc. Ladies have yellow number bibs and start numbers 17000–19999, and Vasaloppet veterans (those who have skied over 30 races) have orange number bibs and start numbers 30001–30349. The top skiers in the cross-country cup Visma Ski Classics also have coloured vests: the top man (Andreas Nygaard) and top lady (Britta Johansson Norgren) in the overall cup Visma Ski Classics Champion wear yellow “CHAMP” vests. The leader of the sprint cup Visma Ski Classics Sprint (Anton Karlsson) wears a green vest. Leaders in the youth cup Visma Ski Classics Youth (woman/man up to 26 years of age) wear pink “YOUTH” vests. To call yourself a veteran you must complete a Vasaloppet and/or Öppet Spår according to Vasaloppet’s rules for 30 years (only one race per year counts). After the 2018 Winter Week 1,023 veterans have skied 30 or more races. In Vasaloppet, veterans start in their own row in start group 5 (closest to the wall). Bengt Eriksson, Sälens IF, skied his 60th race in a row in 2013 (54 Vasaloppet and 6 Öppet Spår between 1953 and 2013). Börje Karlsson, Landsbro, has skied the most “real” Vasaloppet races, 59, though not in a row. (Börje has started Vasaloppet 60 times but in 2017 he did not finish. However he came back and finished in 2018.) 85-year-old Börje is registered for Vasaloppet again this year. 32 veterans have skied 50 races or more. Six veterans who have completed 49 races are registered for Vasaloppet 2019 to complete their 50th race! Anne-Marie Richardsson, OK Landehof, skied her first race in 1979 (Öppet Spår). She is registered for Vasaloppet 2019 as the first woman to ever participate in their 40th race. In a row, to boot! Carina Hammarstrand, skiing nine races throughout the Winter Week! Mikael Kulanko, skiing multiple races – in a Superman costume! Every Vasaloppet skier loses an average of three kilos during a race, which means that about 23,000 Vasaloppet skiers are “missing” after the 94 races. Your length shortens during Vasaloppet. The discs in your spine compress and the arch of your foot flattens. During a Vasaloppet, the skiers shrink by a combined 220 metres. Vasaloppet skiers produce so much energy that it could light 884,000 low-energy lamps (15 W) or about 2 million LED-lights. Ekströms blueberry soup has been served in Vasaloppet since 1958. Each participant in Vasaloppet’s Winter Week drinks about 0.7 litres of blueberry soup. Together, in 2018, they drank 38,700 litres of blueberry soup, 31,500 litres of sport drinks, 12,300 litres of vegetable broth and 3,090 litres of coffee at the seven food checkpoints. Also consumed were 186,000 Vasaloppet buns. For all this, 494,000 paper cups are needed (which are, of course, recycled). If a participant is found to have littered in or along the Vasaloppet course (which is a nature reserve) then he or she will receive a time penalty of 15 minutes. Disposing of litter is permitted in three different ways: In the bins at the Vasaloppet checkpoints; In the marked littering zones between each Vasaloppet checkpoint; Where you as a participant know that a team leader or associate will pick up what you throw. For elite skiers Vasaloppet holds special dialogue, requiring that each team takes responsibility for, and picks up, any of their waste that is thrown along the track. Vasaloppet’s competition jury consists of Ulros Ponikvar (Slovenia), Ludvig Remb (Sweden) and Bo Johansson (Sweden). The latter is also a competition manager. The lowest temperature at a Vasaloppet start in Sälen was -30 degrees C, measured in 1935 and 1987. The highest temperature, +4.5 degrees C, was in 2015. Vasaloppet’s operations annually generate about 20–25 million SEK that goes back into the sports movement. About 50 percent goes to the owner clubs (IFK Mora and Sälens IF), about 30 percent is compensation to clubs who supply functionaries, and about 20 percent is in the form of fees to the Swedish Ski Association and Swedish Cycling Federation, which in turn is distributed to their sports clubs. Vasaloppet doesn’t just have a Winter Week. Since 2009 there’s also a Vasaloppet Summer Week with ten mountain bike and running races, such as Cykelvasan 90 and Ultravasan 90. See the complete list of races below. Vasaloppet’s Summer Week 2018 attracted 33,147 registered participants! Vasaloppstrippeln means completing three different types of Vasaloppet during one and the same calendar year. The participant skis, cycles and runs 90 km or 45 km. For “Vasaloppstrippeln 90” you must ski 90 km in Vasaloppet or Öppet Spår, bike Cykelvasan 90 or Cykelvasan Öppet Spår, and walk, jog or run Ultravasan 90. To complete “Vasaloppstrippeln 45” you must ski Halvvasan, bike Cykelvasan 45 and walk, jog or run Ultravasan 45. In 2018 there were 247 participants who completed Vasaloppstrippeln 90 and 39 completed Vasaloppstrippeln 45. For those who want to ski Vasaloppet next year – 499 years after Gustav Vasa’s adventure in Dalarna – registration opens for Vasaloppet 2020 on Sunday, March 17, 2019 at 09:00 on vasaloppet.se. Vasaloppet 2020 will run on Sunday, March 1, 2020.